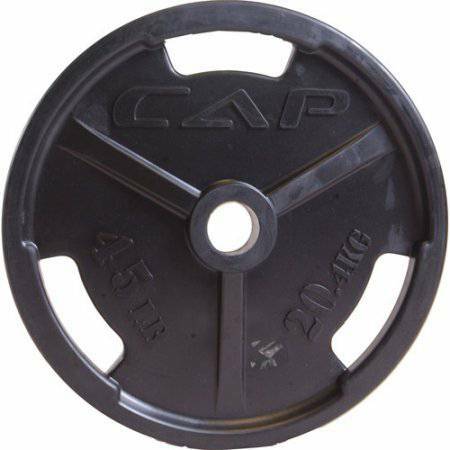 Add impact protection and additional weight room safety with CAP Barbell OPHR barbell plates. When it comes to protecting your gym floors from impact caused by dropped weight plates, a thick rubber coating applied to each plate can drastically reduce potential damage such as scuffs, abrasions and even dents. Not only does this rubber coating protect floors and surrounding equipment, but it also helps to absorb shock and impact within the plates and bars which will help further extend the life of your investment. Protecting members from smashed toes due to dropped weight plates is also paramount in creating a safe workout environment. 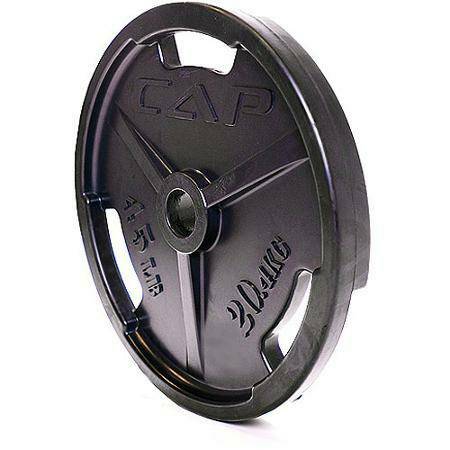 Each CAP Barbell Rubberized Olympic Grip Plate features a total of three hand grip slots that are molded into the cast iron plate and then fully coated in rubber for a comfortable, slip-resistant grip. The back side of each plate includes recessed grips which makes picking plates up off the floor much easier than non-recessed plates. Olympic Grip Plate: 45 lbs.